Fourstar Crook walks down Victory Lane after winning the Flower Bowl led by co-owners Michael Dubb (left) and Gary Aisquith (right). 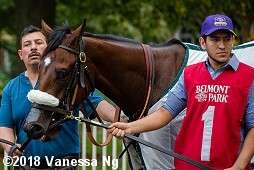 Sunday was the final day of Breeders' Cup Challenge "Win and You're In" preps at Belmont Park. 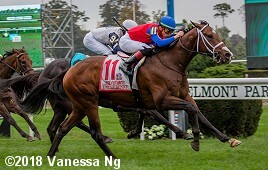 Conditions were typical for early October on Long Island, with overcast skies and temperatures in the high 70's, with the main track fast and the two turf courses good. The feature race on Sunday was the $500,000 Flower Bowl (G1), with a field of 7 older fillies and mares going 1 1/4 miles on the inner turf course in this Win and You're In event for the Filly and Mare Turf. New York Stakes (G2) winner Fourstar Crook was sent off as the 4-5 favorite off her 2nd place finish in the Beverly D (G1). 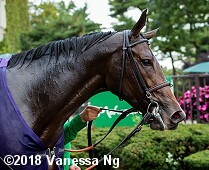 In to challenge her included 4-1 second choice Onthemoonagain, 4th in the Glens Falls (G2), and 9-2 third choice Lady Montdore, winner of the Glens Falls. Jockey David Cohen sent 56-1 longest shot Feeling Bossy to the lead first time by through slow fractions of 25.71, 51.72, and 1:15.80 while pressed by 19-1 Danceland and 15-2 Tricky Escape. On the far turn, Onthemoonagain moved up to take the lead through 1 mile in 1:39.82, and led to the 1/8 pole through 9f in 1:51.87. Fourstar Crook, last early under Irad Ortiz Jr., came out 5 wide for the drive and rallied to win going away by 2 lengths over Onthemoonagain in 2:03.28. It was a long 4 3/4 lengths back to Lady Montdore third. Left: Fourstar Crook in the winner's circle. 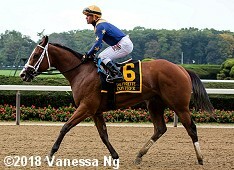 Winning trainer Chad Brown said, "This horse ran super. We expected a short field and that the pace wouldn't be that strong, and it wasn't, but she was able to overcome it. She's a really consistent horse and she particularly likes Belmont. She ran to her odds. She seemed very deserving to finally win a Grade 1. When you look at who's she's beaten when she's not in Grade 1s, and who she's lost to�by short margins, this filly is very deserving to finally achieve that and remarkable at age six. Michael Dubb and his partners have really done right by this filly her entire career. Every winter she's gone to Ocala and rested, and every year she's come back bigger and stronger. They've managed her very well. The way she finished today she surely looks like a mile the three-eighths won't be a problem for her. We know that it will be a much deeper field, but she's game and she's not afraid to run against anybody, I tell you that. She's a brave horse." Right: Fourstar Crook heads back to the barn after the race. Winning jockey Irad Ortiz Jr. said, "She flew home. She was going so comfortable and when I asked, she just exploded." Left: Second place finisher Onthemoonagain in the paddock. 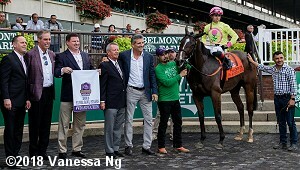 Trainer Chad Brown said, "I was very happy to see run a really good race to go along with how well she's been training. I thought she ran well. She got a beautiful trip by Javier. I believe this filly's best trip is probably 1 1/8 with some pace in front of her. She appreciates some firmer ground than she got today, with that said I thought her effort was very good. I think we finally have her on the right track." Right: Third place finisher Lady Montdore returns after the race. 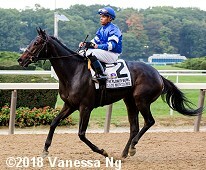 The Tom Albertrani trainee improved her record to 3 wins, 1 second, and 3 thirds in 8 starts, earning $293,956 for owner-breeder Godolphin Racing. Jaywalk takes her walk down Victory Lane with trainer John Servis on the right. 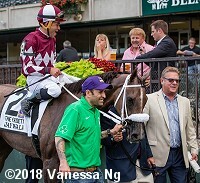 The $400,000 Frizette Stakes (G1) featured a field of seven 2-year-old fillies going 1 mile around 1 turn of the main track, looking for automatic entry into the Breeders' Cup Juvenile Fillies. Covfefe was sent off as the 3-5 favorite in the field of 7 off her 9 1/4 length debut win at Churchill Downs. 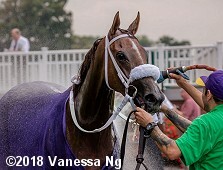 In to challenge her included 4-1 second chice Cassies Dreamer, 3rd in the Spinaway (G1), and 13-2 third choice Jaywalk, winner of the White Clay Creek Stakes at Delaware Park. Jockey Joel Rosario sent Jaywalk to the lead exiting the chute through fractions of 22.63, 45.65, and 1:09.71 while pressed by 9-1 Nonna Madeline and stalked by Covfefe. Entering the stretch, Jaywalk began to extend her lead, opening up a 3 length advantage over the tiring Covfefe in 1:21.95. Kept to task by Rosario, Jaywalk drew off to win by 5 3/4 lengths over late-running 14-1 Brucia La Terra in 1:34.57. It was another 3/4 length back to Cassies Dreamer third. 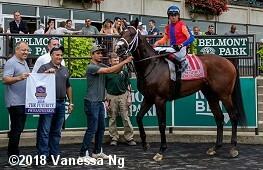 Left: Jaywalk in the winner's circle. 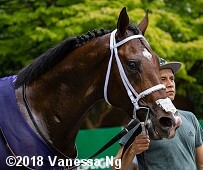 Winning trainer John Servis said, "When she was in front like this, and running so comfortable, I mean, they were running fast fractions, but they were doing it so easy. She's a really nice filly. There was a couple of tough horses in here that have run better numbers but you really don't know how far they're going to go, and if they can sit on a hot pace like that and keep going. I really thought this filly would run all day, and I really didn't think that would be an issue for her. I want to see what kind of numbers she ran, and how she comes out of this, and Its obviously a huge effort for her. I don't want to see a huge improvement and wheel her right back in four weeks. We'll see. We'll see how it shapes up." Right: Jaywalk gets hosed down after the race. 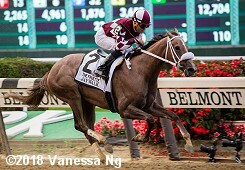 Winning jockey Joel Rosario said, "She wanted to go to the front. I thought there was a lot of speed on paper and then John told me just let her break and let her run however she wanted. I just let her go ahead and be happy and she really handled it. She looked like she would keep going at the quarter-pole and her long stride she really handled the trip well. I think she'll handle two-turns [going forward] she certainly has the speed to. Left: Second place finisher Brucia La Terra in the paddock. Jockey Manny Franco said, "I thought I got a good trip. They were rolling in front and she gave me all that she had. She finished well." Right: Third place finisher Cassies Dreamer in the paddock. Trainer Barclay Tagg, who trains both Brucia La Terra and Cassies Dreamer said, "I was very pleased with how they both ran. Not bad for 18-1 with Brucia La Terra. We liked them both. They weren't expensive horses or anything like that, but they've certainly been training well. We wanted to run them and we were pleased with the outcome. It costs so much to go to the Breeders' Cup now. I would've love if one of them would've been able to catch it, but if you can't, you can't. The winner was much the best." Fourth place finisher and beaten favorite Covfefe returns after the race. The Brad Cox trainee improved her record to 1 win, 0 seconds, and 0 thirds in 2 starts, earning $57,600 for owner LNJ Foxwoods. Kicking off the stakes trio was the $150,000 Futurity Stakes. 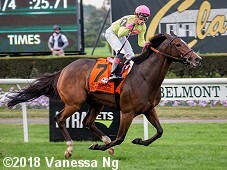 After over 100 years run on the main track, the race was switched to the turf this year as a Challenge event in the new Juvenile Turf Sprint division, however the surface switch required a loss of Graded stakes status. A field of 11 two-year-olds sprinted 6 furlongs over the Widener turf course. 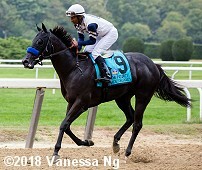 Sorrento (G2) fourth place finisher Dragic was the 3-1 favorite off his 3rd place finish in the Kentucky Downs Juvenile. 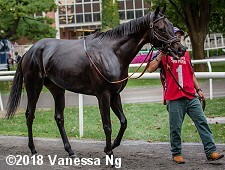 In to challenge him included 5-1 second choice Uncle Benny off his debut win at Monmouth, and 11-2 third choice Swamp Rat, 4th in the With Anticipation (G3). 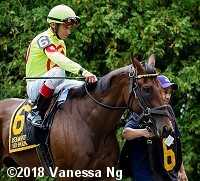 Jockey Jose Lezcano sent 6-1 fourth choice Joyful Heart to the lead and he set fractions of 22.46 and 46.30 while pressed by 16-1 Real Money and stalked by Dragic. Turning for home, Joyful Heart tired allowing Dragic to gain the front through 5f in 58.71, however Uncle Benny, last early under Irad Ortiz Jr., came out 8 wide for the drive and outfinished fellow closer and 56-1 longest shot Backtohisroots by 1/2 a length in 1:11.26. It was another 1 1/2 lengths back to favorite Dragic third. Left: Uncle Benny in the winner's circle. Winning trainer Jason Servis said, "Around Monmouth time, I told people he was one of my best 2-year-olds, so we're high on him. We think he's a nice horse, and he looks the part too. He's a big, good-looking horse. He's massive. He's got Storm Cat on the dam's side and his stallion won a couple of Group 1s I think in Europe on the grass, so I wasn't worried about the turf. I don't know if we'll do the (Breeders' Cup Juvenile Turf) or the (Juvenile Turf) Sprint. I don't know if he'll get in the long one, but I think he'll run further. I don't know if he'll get up 5/8, but I know he'll get a mile. He'll go in one of those races." Right: Uncle Benny heads back to the barn after the race. Winning jockey Irad Ortiz Jr. said, "I'm just so happy for Jason, it's been such a good year for him. He's a nice horse. It was the first time I rode him. We had the outside post and he broke a step slow. I didn't want to rush him out of there, he's a baby. They ran away from and I just dropped in. I didn't panic. I waited and when I made the run on the outside, he took off. It's different. It was his first time on the grass. I was confident on him and didn't panic. I just let him be happy and ride him from there." Left: Second place finisher Backtohisroots returns after the race. 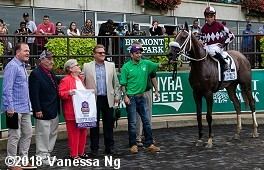 Trainer John Terranova said, "We breezed him on the grass a couple of times leading up to this. We claimed him at Saratoga and we liked the horse. 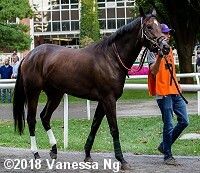 He gave everybody a good feeling, so we ran him in the Hopeful just for lack of options, and he trained really well and acted really well, so we gave him a shot. It didn't work out, but immediately afterward, Tonja and everyone was saying, 'Let's just go grass.' He's bred for it, he's got that physically build. So we thought, 'Alright, when we get back to Belmont we'll nominate to the Futurity and work him on that and see. You never know what you're going to see until you try it. Right: Third place finisher and beaten favorite Dragic heads out of the paddock before the race. The Wesley Ward trainee improved his record to 1 win, 0 seconds, and 2 thirds in 4 starts, earning $103,600 for owner Steven Michael Bell.